Knowing how to paint Formica can help you spruce up old countertops while saving money. Formica countertops can often be found in older homes, apartments, and mobile homes, and after years of wear and tear they can look rundown and their patterns can fade. Fortunately, you don't have to replace them. Painting Formica countertops (and backsplash if desired) is an easy and inexpensive alternative to costly kitchen repairs. Obviously painting kitchen countertops isn't as desirable as replacing them, but there are several advantages. Painting is less expensive than replacing counters. Painting is easier than retiling and can be done with very few materials. Painting is a fairly quick and easy project, so if you decide you don't like it or need a change, it can easily be redone. Provided one uses eco-friendly paints, it can be far more environmentally friendly than replacing because nothing goes in the landfill. Painting Formica counters requires a few basic materials. As with any paint job, preparation is very important. Take absolutely everything off the counters. The project will likely take at least two days (including drying time) so plan accordingly when you're putting items away. Clean the counters thoroughly. Using an ammonia-based cleaner, or a solution of bleach and water should remove any grease and dust. Using a fine-grit sandpaper, lightly sand the surface to be painted. This will help remove any leftover grease and create a rough surface for the primer to adhere to. Wipe away any excess dust with a damp cloth. Tape off areas to be painted. This will help keep paint from getting onto the wrong areas and will create a nice straight line. Tape off walls, backsplash (unless it's being painted as well), cabinets, etc. Once it's clean and dry, prime the entire area to be painted. Put a small amount on a paint roller and work slowly to avoid having any air bubbles form. Allow the primer to dry. Once the primer is dry you might want to consider giving it another light sanding. Be sure to remove all of the dust. Start painting with either an acrylic latex enamel or epoxy paint. Epoxy paint is often recommended because it lasts longer and has a hard, durable finish. Be sure to put on enough coats (two to three depending on the type of paint) and let it dry completely between coats. After the last coat is dry you might want to apply a polyurethane finish which will seal the paint and give it a nice finish. Any time you're taking on a painting project, be sure to work in a well-ventilated area. Open the windows and use a fan if necessary.During the drying process try to use the room as little as possible in order to reduce the risk of any accidental bumps or damage. Also, you might want to consider keeping a fan going in order to keep any dust from settling. 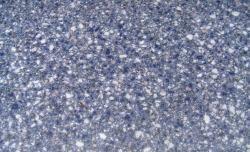 Remember to treat painted Formica as you would other new countertops. Don't cut or slice foods directly on the counter as knives can cut into the surface. Don't place hot pots or pans on the surface. Clean regularly with soap and water and try not to let it get stained (wipe up spills immediately). Knowing how to paint Formica will increase your options when your kitchen needs an update. If you want new countertops but can't afford to replace them, a nice paint job can be a great interim solution. It's easy, inexpensive, and if done properly, can look great.